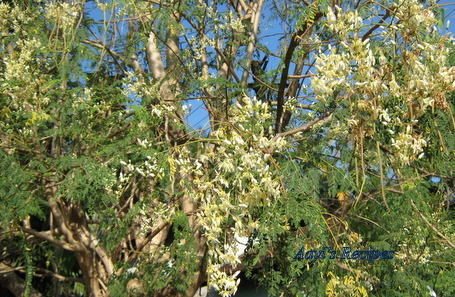 We find drumstick tree in garden of almost each and every house in our area. They provide full iron and so used by everybody especially women to supliment their need of nutritional iron. This is drumstick season. 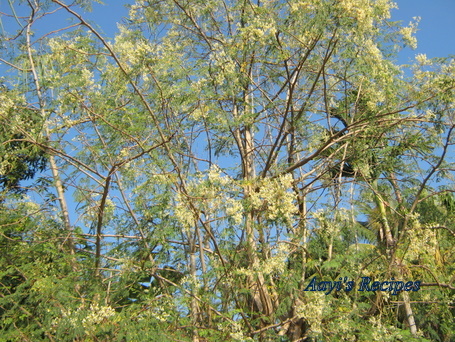 We use the flowers and leaves in konkani cooking along with drumsticks. 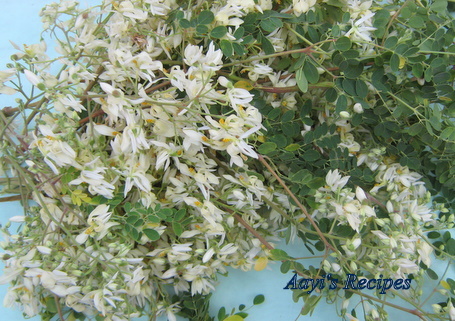 Drumstick flowers are used to prepare cutlets. My kids used to love these. Many of our neighbors and relatives used to give us these flowers, freshly plucked from the tree. Soak toor dal and rice in water for about thirty minutes. Heat a little oil and fry coriander seeds, urad dal, asafoetida and red chillies. 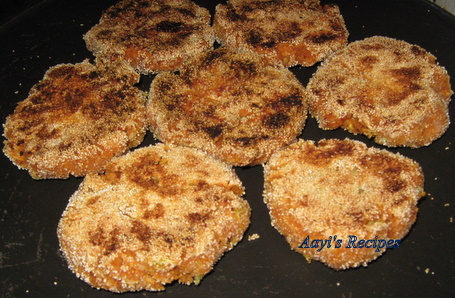 Grind coconut, jaggery, tamarind and above fried items. 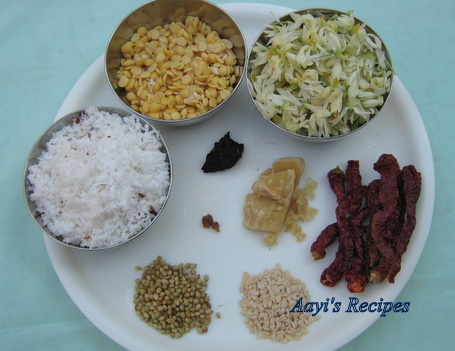 Continue grinding with soaked dal and salt using minimum water. Mix this masala with drumstick flowers. Make small balls and press with the palm to flatten them. 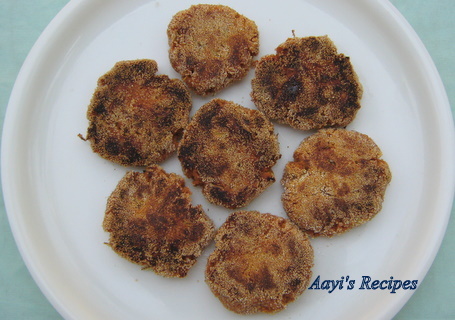 Roll these in rava and shallow fry them on both sides. Serve hot. Hi Varada ! It was so nice reading about mhashinga sange fulla vado .It took me in my child hood days. Thanks a lot. My mother used to make bhutti of these flowers. That too tastes very yummy. 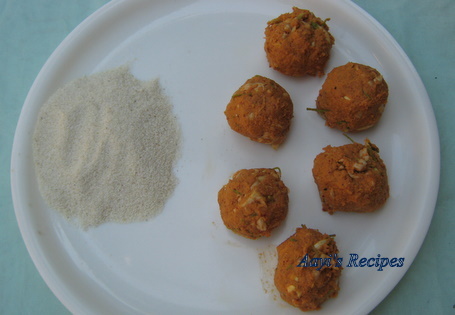 make a seasoning of mustard seeds and asafoetida. in a little more oil saute a lot of finely chopped onions and chopped flowers. when done add salt and ground masala of fresh coconut, 2-3 dry raosted chillis,a small ball of tamarind, and a teaspoon of roasted coriander seeds and raw rice.add very little water. let the whole mixture be fried till the oil leaves sides. goes well with chapatis . My mother makes tomato bhutti in the same manner. I love this recipe. Where I am in Australia, I only get the frozen drumsticks and certainly not the flowers. Maybe I’ll go hunting for them when I am up in Queensland where you certainly get more tropical food. wow very interesting and new to me!!! Varad pacchi, this dish is new to me. I know the pumpkin flower one..it used to b a hot favorite in my home. 🙂 Thanks for sharing the valuable info n the lovely recipe..loved the blooming pic of tree. I make Kerala style upkari with drumstick leaves n eggs, my husband’s fave. Thanks again! somethg nice & very interesting ! yummmm!! A wonderful and mouth-watering recipe!! For those of you in tropical climate, here’s a suggestion. If you have some garden place, you can grow your own Drumstick tree. Just pluck a small branch of about 3 feet length of the mother tree; from any friendly neighbourhood : dig a hole of about 8″ dia. x 12″ depth and plant the branch/sapling in the whole and cover up with good mud. Water regularly. The tree grows very fast in a good soil. Very next year, you will have flowers/sticks. Best of luck. I was introduced to drumstick flowers and tender leaves veg. after my marriage by my husband’s best friends mother and I love it. 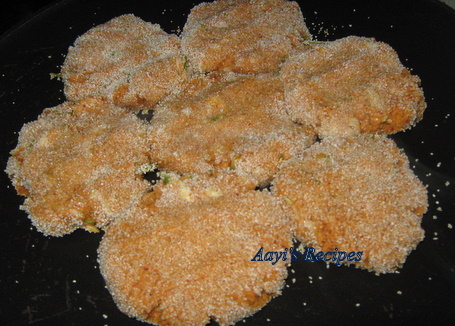 I have never tried making cutlets. Will make them and I am sure the rest of my family will love them. today i have tried the above and its turned out fantastic. thank you very much for adding healthy & delicious recipes. Turned out perfect and yummy. Got the muska phool from a friend’s garden. Else, it would not have been possible for me to get these flowers. They vanished in a jiffy. Thank you so much for such an awesome recipe. a new recipe…but just wanted to know..the drumstick flowers are v bitter….i normally boil them changing water…at least twice…so dont the cutlets go bitter?…or is it that the bitterness is absorbed by the rest of ingredients?